The world’s largest Original Newspaper archive, Historic-Newspapers.co.uk, has launched a new range of Vintage Recipe Cookbooks, showcasing recipes & cookery ideas throughout history. These newspaper books are perfect for any food lover, or for those who want a slice of history with a more niche focus. The contents include landmark food news, such as the implementation of rationing, recipes and popular food options from selected decades as well the appearance of famous celebrity faces who are still followed today. Each printed page has been reproduced from an original, genuine newspaper article, with no embellishments or alterations, which allows recipients to see other news articles from the same day the recipe was published. The books are available in either a softback version – with colourful front covers – or a hardback version, which comes bound in a purple cover design and features intricate, gold embossing on the front. Both options can be personalised with a recipient’s name and a personal message. There’s also the option to have the recipient’s name embossed in gold on the front cover of the hardback design. Articles appear in black and white, with decade options starting from the 1930s up until the 1990s. 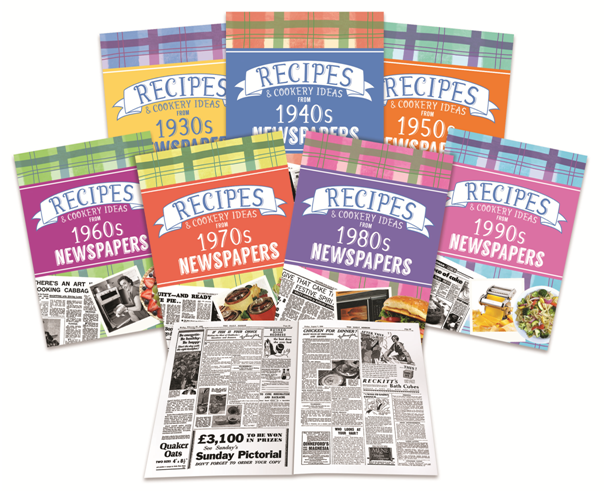 The entire Vintage Recipe Book range is available on Historic-Newspapers.co.uk now, retailing from £12.99. Kevin Sears, Ecommerce director at Historic-Newspapers.co.uk, said: “Food has always been a hot topic in terms of press, whether it’s a new chef to watch out for, a well-loved recipe from a specific era or the announcement of impactful food industry changes in society. “We’ve designed this book to help reignite memories from the past through our sense of taste and smell, transporting us back to a time we thought was forgotten,” he adds.